ahhh so cute posing for you!!! So cute and beautiful as always ! 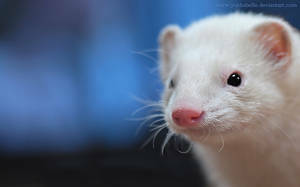 If I have my own apartment, I would like to have ferrets. Oh!!! I've missed your fuzzies!!! The blue colour goes so well with Doodle's silver gray fur!